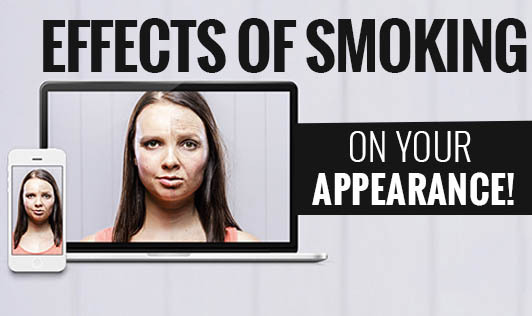 Effects of smoking on your appearance! Most people know that smoking is bad for the heart, brain, and the body. You would probably kick the habit right away if smoking's ill effects were a little bit more obvious. Unfortunately, the effects of smoking take some time to show up. What if smoking would leave a scar on your face, for instance? Here are some noticeable effects of smoking and how it affects your appearance: Premature aging and wrinkles: This is the most obvious case of how smoking ruins your skin. Who would want to look older than their real age? Experts say that smoking accelerates aging and hampers blood supply that keeps the skin tissue looking agile and healthy. Yellow fingers: The nicotine in your cigarette can stain your fingers and nails as well. Wouldn't it be much easier and less painful- to just quit? Icky teeth: Who wants to see yellow teeth that results from all that nicotine in the cigarettes while you smoke? You can probably restore the ruined looks from smoking just by doing one simple thing, "QUITTING!" Scarring: Nicotine in cigarettes causes vasoconstriction which is narrowing of the blood vessels that can limit the oxygen rich blood flow to the tiny vessels in the face or other parts of the body. Therefore, your wounds will take longer to heal and you will have scars that are quite bigger and redder than you would in a non-smoking parallel universe. Psoriasis: Psoriasis is an autoimmune skin related disorder that can probably show up even if you have never touched a cigarette. However, if you do smoke, your risk for this scaly skin condition increases. Natural glow is gone: Cigarette smoke contains carbon monoxide which displaces the oxygen in your skin while the nicotine reduces blood flow that will leave your skin discoloured and dry, thus, making it grey and dull over time. Smoking cigarettes also depletes the necessary nutrients such as Vitamin C that helps to protect and repair damaged skin. Flabby tummy: Cigarettes can be an appetite suppressant which means that smokers often have a lower body weight than non-smokers. Researchers have found that smokers had more visceral fat than non smokers. This deep fat pads internal organs that can build up in your midsection, eventually increasing the risk of other diseases such as diabetes. Stretch marks: Nicotine damages the fibers and connective tissues in your skin causing it to lose elasticity and strength. Anyone can get stretch marks due to rapid weight gain or weight loss but cigarettes can be a contributing factor. Skin cancer: Cigarettes can also increase one's risk of skin cancer. Smokers are three times more likely than non-smokers to develop squamous cell carcinoma which is the second most common type of skin cancer. Cataracts: Cigarette smoking can increase the risk of cataracts by putting oxidative stress on the lens of the eye. You can restore ruined looks from smoking by doing just one thing. It's just the simple act of quitting!